You’ve heard of those shows, right? Folks who are convinced the world is going to end due to [fill-in-the-blank catastrophe] and the only ones who will survive are those who have a sealed bunker with meals-ready-to-eat, bottled water, and plenty of ammunition, etc. My favorite was the one who was learning to make his own wine with the expectation that in the future alcohol would be the new currency when the US dollar loses value. (Given the coming wine shortage, he might be on to something). This week has been my prepping week. I’m not concerned about the end of the world, I’m concerned about leaving the husband alone for a week. The last time I was out of town for a week, he conveniently scheduled a trip out of state to visit family. I secretly think he didn’t want to have to feed himself for a week. I’ve spoiled him with my cooking and created a dependency. We’ve stocked up on cereal, peanut butter, bread, oranges, and baby carrots. The husband anticipates a crazy week of work, and intends to subsist on sandwiches. But I want him to have some hot options, too. The perfect solution is frozen burritos. 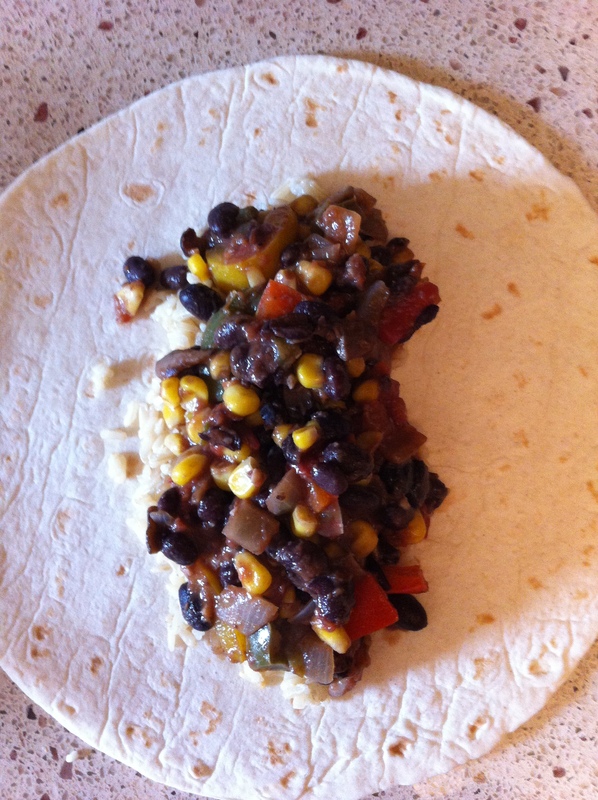 I love easy meals that can be pulled from the freezer and be ready in under 10 minutes. The husband reminded me of my single-girl day interpretation of this love with my Lean Cuisine-filled freezer. Guilty. But the new me strives for fewer preservatives and more homemade food while still providing convenience. These burritos fit the bill. The recipe is inspired by Martha but adapted to provide more veggies to help us meet our daily dose! It has become a household favorite for the husband and me. They make the best lunches, especially if you can add some fresh avocado! 1. Cook the rice according to the instructions, using 1/2 cup of vegetable broth in place of some of the water. I use a rice cooker to save stove space and keep it fool proof. 2. 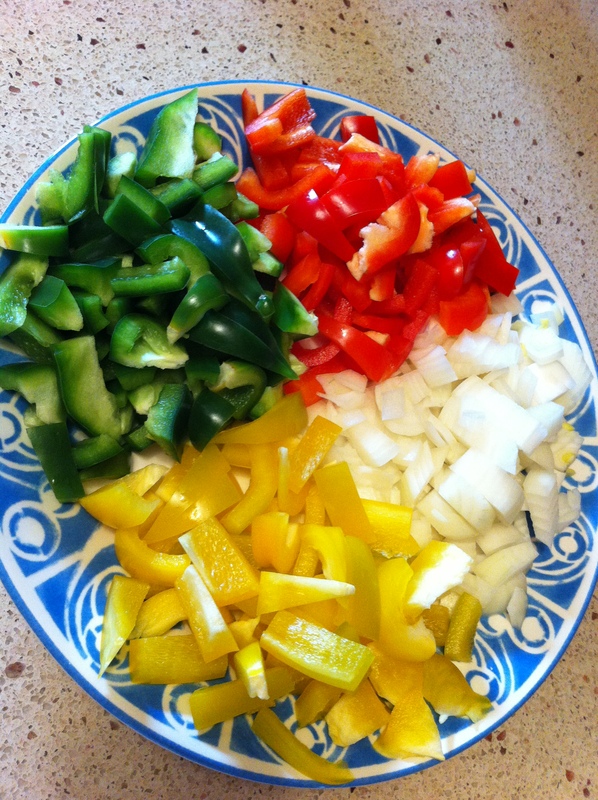 Chop all of your veggies–onions, mushrooms, and peppers. Heat the olive oil in a large saucepan over medium heat. 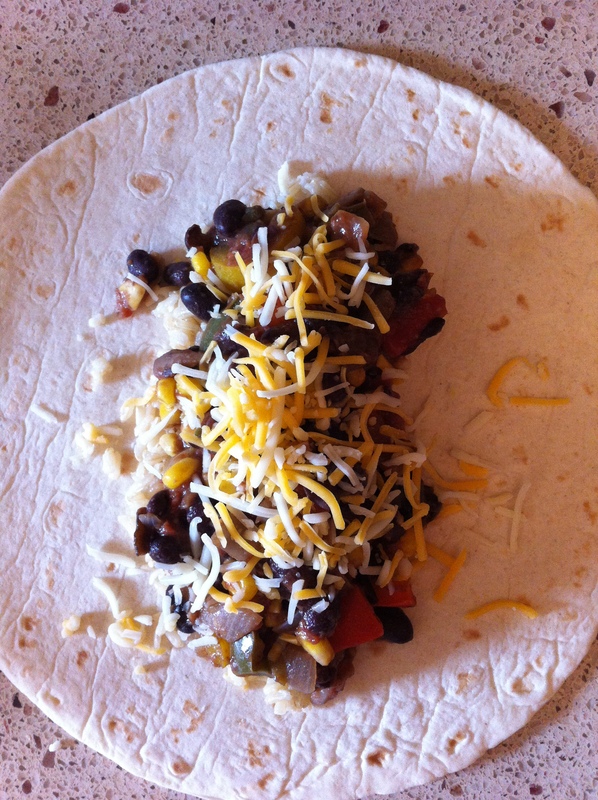 Add the onions, mushrooms, garlic, and peppers–bell and jalapeno. Add the cumin–more or less based on your taste–and season with salt and pepper. If you like your heat, add some cayenne pepper here. Cook, stirring occasionally, for 10-12 minutes. 3. Add the tomatoes, beans (with liquid drained off), and the other 1/2 cup of vegetable broth. Adjust the liquid based on the status of your mixture. Bring the mixture to a boil, reduce heat and simmer for 10-12 minutes, stirring occasionally. The mixture should thicken up. Add corn and cook to heat through. 4. Heat tortillas according the package instructions, especially if you are eating the burritos right away. 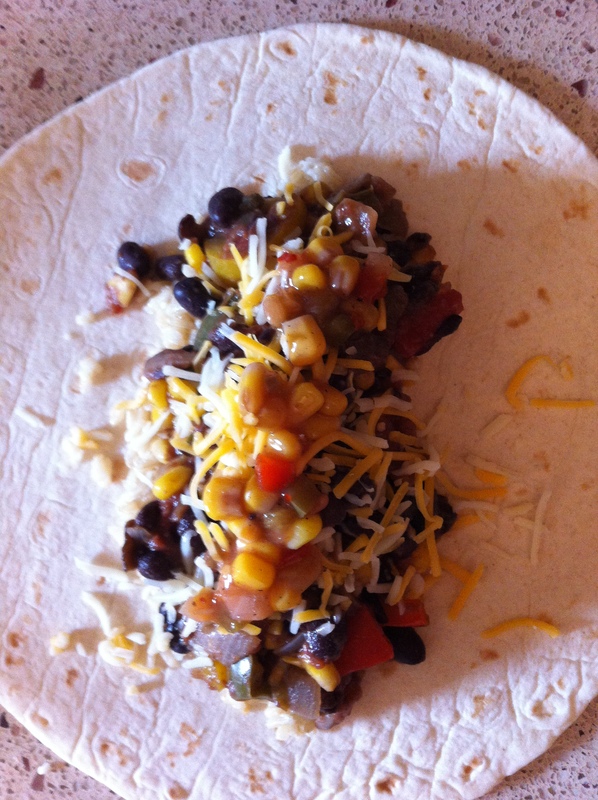 Create your burrito assembly line: tortillas, rice, veggie/bean mixture, cheese, and salsa. Fill the burritos in that order. Roll them up and wrap them in plastic wrap if you are freezing them. Inevitably you will have a weird ratio of leftover ingredients. When I run out of tortillas I like to make a lovely salad, adding spring greens and avocado and eating with tortilla chips. Microwave Remove from plastic wrap and place on a microwave-safe plate covered with a microwave-safe bowl. Microwave on high for 3-4 minutes to defrost. Remove the bowl and microwave on high for 3-4 minutes more. Oven Preheat oven to 450 degrees. Remove from plastic wrap and wrap in aluminum foil. Heat on a baking sheet for 40 minutes. Remove foil and bake until crisp, about 5-10 minutes. 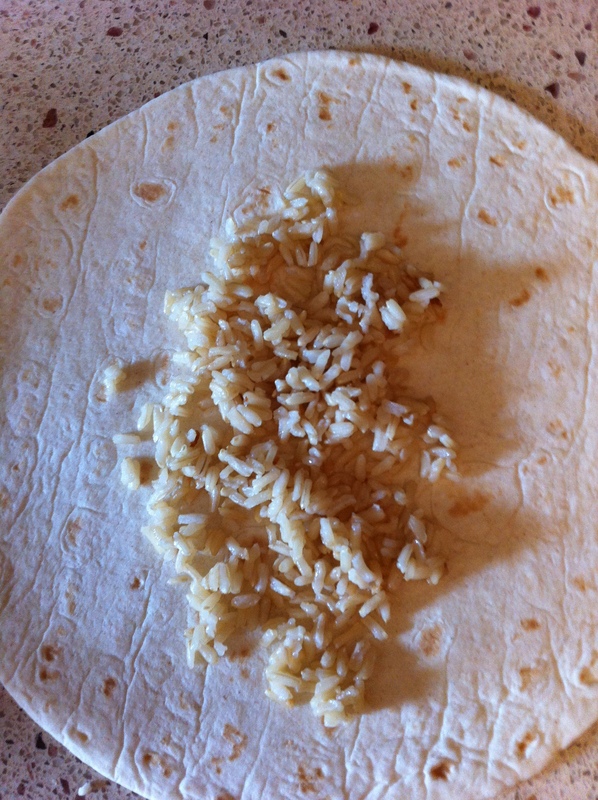 If already defrosted, heat unwrapped burritos for 10 minutes. (Which means you can defrost in the microwave and then heat in the oven for the best of both worlds–fast and crispy). Next Post Next post: Home with my people!